Lego bricks, K'Nex, cups, and boxes are a few of my girls' favorite constructive toys. They enjoy manipulating, connecting, and building. And while they play, they gain seven valuable benefits. 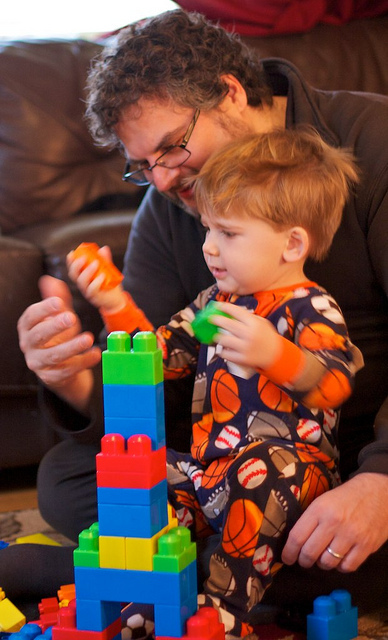 Your kids can have fun building brilliance, too, thanks to constructive play. Fine motor skills describe your child's ability to control their hands and fingers as they move, grip, and write. These skills improve when kids play with construction toys. For example, I've watched my girls grow from barely being able to stack two blocks to building elaborate buildings. Clicking pieces into place, manipulating blocks, and holding blocks and pieces of all sizes hones their fine motor skills and prepares them to dress themselves, throw a ball, and hold a pencil. The other day, my daughter tried to build a gangplank on the pirate ship she made out of blocks. Her first five ideas didn't work, but she kept brainstorming and finally found a solution. I'm grateful that her toys teach her how to solve problems. Because of constructive play, she's learning to think outside of the box, think quickly on her feet, be flexible, and keep trying until her vision becomes reality and she achieves her goal. Math: Counting, addition, subtraction, and basic geometry all come into play. Reading and writing: Spacial awareness improves a child's ability to read and write. Science: Tinkering and experimenting, kids explore cause and effect, hypothesize, and develop curiosity. Constructive play allows kids to create whatever fantasy they imagine. Last week, my girls built a castle complete with a moat and dragon. This week, they built a tall spaceship. And as they play, they expand their imaginations and creativity that will prepare them to face real-world challenges and problems that require unique solutions. Most kids, my girls included, are not naturally focused or patient. They need these important skills to succeed in school, relationships, and every area of life, though. That's another benefit of constructive play. Kids have to focus as they build a project from start to finish and work carefully so they don't knock over their creation. As they play, they actually become more focused, patient, and prepared for life. Blocks are one toy that brings kids together. They're ideal for boys and girls, and my girls often work together to create elaborate sets for their stories and search for the small pieces they need. This social interaction during constructive play encourages them to be cooperative, work as a team, and self-regulate. With these skills, my girls are better friends and teammates in their everyday social interactions. I remember when my daughter built her first castle from blocks. She was only four, but she squealed with delight and insisted that I take a picture of it. She was so proud, and that confidence gave her courage to continue to build even bigger masterpieces. It encourages me to see how my girls' confidence grows as they play with constructive toys! Constructive play offers seven key benefits and builds brilliance. It's an ideal way to play. What other benefits do these toys provide your kids?